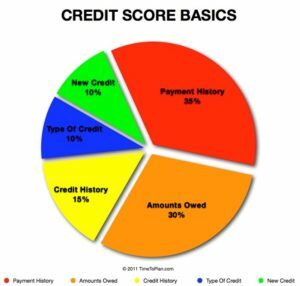 What Makes Up Your Credit Scores? Your credit score is a three-digit number that can range from 300 to 850. Most scores range from 600 to 700. A higher credit score increases your chances of getting approved for a loan and obtaining a lower interest rate. Each credit bureau has their own systems that reflects your ability to repay your debts, each with their own nuances. On time payments with little or no late payments will be sure to help you keep your scores high. Balances of less than 50% of each existing line are in your best interest. Going above 50% is very detrimental to your scores. The longer the credit, the better it is. You build strong credit the longer you have your good payment history. The more inquiries you have, the lower the score. It is like a picture in time so when you have inquiries, it shows you may be increasing your debts. You want your income to support your lifestyle. Cancel the credit cards you don’t use:Credit is based on history so keep the oldest credit cards if possible. Paying off collections improve your scores: Credit is based on length of time, so when you pay off a collection, you start from a new point in time. Past credit problems will always be a problem.The impact of old credit fades in time as new credit replaces it. If you had a bankruptcy, you can’t get a mortgage.Not True! Some loans can be done the day after a bankruptcy. Credit is one of the most important pieces of the puzzle when it comes to purchasing a home. It entails more than just your payment history. It takes into consideration your credit usage, length of time you had your credit line, the number of credit cards you have and the inquiries into your credit. Each mortgage product is based on guidelines, which differ depending on the loan. And while lenders look at the credit scores, they also look at how much of a down payment you have to determine your rate. Under the Fair Credit Reporting Act (FCRA), consumer reporting agencies are permitted to include customers’ names on lists used by creditors or insurers to make offers of credit or insurance that are not initiated by the customer. The FCRA also provides customers the right to opt out, which prevents consumer reporting agencies from providing credit file information to others. Optoutprescreen.com is a joint venture among Equifax, Experian, Innovis, and TransUnion, allowing customers to opt out of receiving credit card solicitations by mail. Beginning on August 1, 2005, the Fair and Accurate Credit Transaction Act of 2003 took effect, which amended the FCRA to require consumer reporting agencies to include in their credit offers a statement allowing customers to stop unsolicited offers either by phone (1-888-5OPTOUT or 1-888-567-8688) or via https://www.optoutprescreen.com . The Optoutprescreen.com is not accessible by users of ISPs located outside the United States and the U.S. Territories. Customers may opt out from receiving offers for either five years or permanently. To opt out permanently, customers must confirm their requests in writing, by mailing in a Permanent Opt-Out Election form, available through the website. Customers who have opted out will no longer be included in offer lists provided by consumer reporting agencies. Customers who have previously completed an opt-out request may request to opt back in at the website as well.